From shovels to Sherman Tanks, pitchforks to Patriot Missiles, and knifes to Nuclear Warheads, those scrappy Israeli Defense Forces (I.D.F.) have managed to defend a nation that for all intents and purposes should have been wiped off the map a few decades ago. Coming out of 1,878 years of worldwide dispersion and a grave holocaust condition, the Jews have managed to muster up a military mechanism that in just sixty-one years now threatens to send Iran’s nuclear program back to the “stone- age”. Many experts, like eschatologist Hal Lindsey and former U.S. U.N. Ambassador John Bolton, are suggesting that may soon be about to happen. Israel appears readied to knock the nuclear bow temporarily out of Iran’s hand and from my prophetic vantage point this could be a primary reason Iran, formerly Persia until 1935, isn’t listed in the upcoming Psalm 83 confederate invasion of Israel. Persia is omitted from the Psalm 83 bible prophecy but oddly they bare their banner in the Russian invasion of Israel described in Ezekiel 38 and 39, which is an event some scholars, myself included, sequence subsequent to Psalm 83. It could be that a forthcoming strategic Israeli strike on Iran’s nuclear sites renders Iran of little utility to the Psalm 83 confederates destined to soon formulate to destroy Israel according to Bible Prophecy. Amazingly, against all odds, the nation of Israel continues to survive. The Arabs, who for the most part refuse to recognize Israel’s right to exist, have attempted to destroy the Jewish nation conventionally in 1948, 1967, and 1973. When conventional attempts failed the Arabs persuaded the Palestinian Refugees to formulate terrorist organizations like the PLO, Fatah, and Hamas, to antagonize the restoration of the Jewish nation via unconventional methods of warfare. These terrorist groups, many now turned political parties, enabled the Arab nations to maintain clean hands while busloads full of Jewish blood poured into the streets of Jerusalem. In the summer of 2006 the Hezbollah terrorist organization performed a feat the Arab States had never been able to accomplish; they successfully fought against and embarrassed the Israeli Defense Forces. Not Israel, but the Arabs were able to feel a sense of victory in the aftermath of that month long conflict. The Hezbollah proved that the unconventional method of warfare called terrorism worked! The Hezbollah do not comprise an Arab State, rather they are thugs, turned terrorists, processed into militant politicians. Presently they have veto power in the Lebanese legislature and, according to conservative estimates, possess over forty thousand advanced rockets, some perhaps chemically charged, that are strategically positioned for the opportune time to take out Tel Aviv. The present Israeli leadership is so concerned about the current Hezbollah threat that they recently completed the largest civilian defense drill in their nation’s history. Turning Point 3, as it was labeled, was a societal top to bottom shake down of all facets of Israeli civilian life in preparation for the possibility of a multi-front war with Iran’s proxies the Hezbollah, Syrians, and Hamas. Why them and why now? Is Israel expecting President Obama’s dangerous Rodney King “can’t we all just get along” style of Mideast foreign policy, called “engagement”, to fail? Apparently so; Ehud Barak, the Israeli Defense Minister, has all of the I.D.F. and I.A.F. 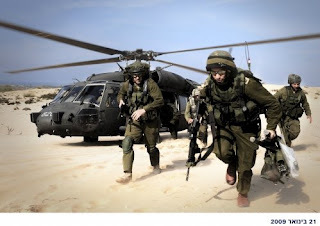 (Israeli Air Forces) combat ready for the same scenario anticipated in the Turning Point 3 exercise. Is something of biblical proportion about to erupt in the epicenter of the Middle East? It appears so and from the prophecy buff’s perspective it’s about time. The international community has had sixty-one years to step up to the plate and promote Israel’s right to exist and to call Jerusalem its holy capital city! Instead they are encouraging that the Jews give back East Jerusalem as part of a 2-State Solution to the Palestinian Refugees. This is not biblically endorsed according to Genesis 12:3, 15:18, Jeremiah 12:14-17 and elsewhere. No my brothers and sisters it appears the time has come for the fulfillment of prophecies that demonstrate today’s Israeli Defense Forces exist in fulfillment of Bible Prophecy. Prophecies like Ezekiel 25:14 and Obadiah 1:18 which announce the I.D.F. will destroy the Palestinians likely leaving hardly a survivor behind. Passages like Isaiah 17:1 and Jeremiah 49:2 that declare the doom of Damascus and the transfer of Jordanian sovereignty into Israeli hands. These passages and a flurry of others highlighted by Ezekiel 37:10, which dares to declare that someday the I.D.F. will be called an “exceedingly great army”, appear about ready to adorn the prophetic pages of modern day history. The only thing standing between the crowning achievement of the I.D.F becoming classified as exceedingly great is a few decisive victories over Israel’s modern day nemeses. Victories that may begin with a surgical strategic strike upon Iran’s nuclear sites and conclude with a massive domino Israeli conquest over the Hezbollah, Syrians, Hamas, and other enjoining members of the Psalm 83 confederates.